Full length recombinant human N-terminal His tagged HP1g (Heterochromatin Protein 1 Homolog Gamma) protein, produced in E. coli. HP1 gamma (UniProt/Swiss-Prot entry Q13185) is a component of heterochromatin. It recognizes and binds to histone H3 tails methylated at 'Lys-9', leading to epigenetic repression of transcription. HP1g may also interact with lamin B receptor (LBR), thereby contributing to the association of the heterochromatin with the inner nuclear membrane. HP1g is recruited to sites of ultraviolet-induced DNA damage and double-strand breaks and may be associated with microtubules and mitotic poles during mitosis. Purified using FPLC, >98% purity as determined by SDS-PAGE. 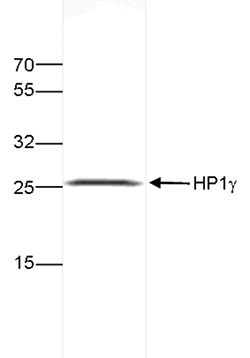 SDS page of the HP1γ recombinant protein. The position of the protein of interest is indicated on the right; the marker (in kDa) is shown on the left. Diagenode strongly recommends using this:	Recombinant human Hp1 gamma (CBX3) (Diagenode Cat# C23010103). Click here to copy to clipboard.